Offering you a complete choice of products which include copper aluminum bimetal sheet and thermostatic bimetal strip. Copper Aluminum Bimetal consists of Copper (sheet metal) claded on pure Aluminum (Base metal) both metals being diffused together to form an inseparable whole by roll bonding process. Copper Aluminum Bimetal is therefore not an alloy and copper alloys are not electro plating but are rather. Mechanically welded to Aluminum sheets. It is know that when Aluminum terminals are directly connected to Copper Terminals. To carry current at a high voltage ,a bimetallic galvanic corrosion occurs, resulting in a high resistance at the joint. The heated joints are oxidized & looses contacts resulting in spark ,voltage dropout power losses and failure, damages machinery. When COPAL Bimetal is placed between Al-Terminal & Cu-Terminal at the joint (with Cu facing Cu & Al facing Al) bimetallic galvanic corrosion is averted due to vacuum in Copper Aluminum Bimetal. Copper Aluminum Bimetal is hence used at dissimilar metal joints of Al & Cu to make similar metal contact. Being client- centric organization, we are engaged in offering an extensive range of Thermostatic Bimetal Strip. The offered product is highly praised in the market for its superior finish & high strength. This product is manufactured using utmost quality material in adherence with market norms. Our offered product can be availed from us in various specifications at affordable price. 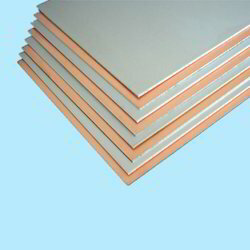 Looking for Bimetal,Trimetal Sheets ?